The Hobo Scene features realistic, electronic, flickering orange and red flame. Real smoke rises from the fire. 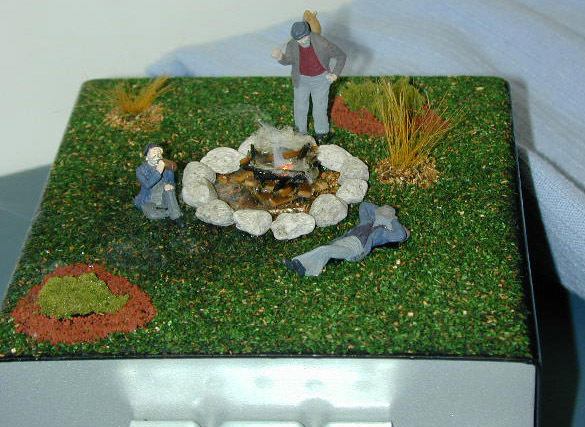 Fully landscaped with campfire and hobo figures. Optional sound unit available. Easy installation. Now add realistic sound to your Willard Animations Hobo Scene! Completely random nighttime digital sounds include crickets, owls, and barking dogs that perfectly complement this animation. The sound can be switched on or off. An external speaker can be connected and located anywhere on your layout. Previously puchased units can have sound added. Simply send us your Hobo Scene and we will install the sound system for you.